According to the Environmental Performance Index (EPI) rankings, India is the fourth worst country when it comes to reducing air pollution. Its ranking dropped from 141 to 177 (out of 180 countries). 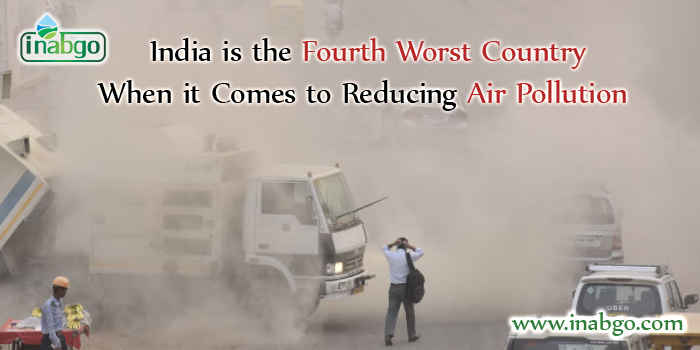 In fact, a report by Global Burden of Disease in 2013 said that air pollution in India was the 5th largest killer. The low EPI rankings indicate that India needs to double its efforts in not only on cleaning up the quality of air but also protect the biodiversity and reduce GHG emissions. Several factors are responsible for air pollution in India. Usually, winters in north India causes a drop in the wind speed while the retreating monsoon bring about a high levels of moisture with it. All this prevents the dust and particulate matter from being flushed out. To make matters worse, Punjab burns most of its agricultural stubble that increases the toxic and carbon particles in Delhi’s air. Further, road dust, car emissions, industrial waste etc all contribute to the city’s pollution level making Delhi one of the most polluted cities in the world. To curb air pollution the Centre has come up with air pollution abatement programmes in 100 cities across India. This program aims to reduce pollution levels in all the 100 cities by 35% in the next 3 years and by 50% in the next 5 years. The programme includes setting up of air information systems, expanding monitoring network, air quality forecasting systems, etc. The programme will also make sure that the rules are implemented strictly and there is sufficient awareness of the programme. To achieve this, all the civic authorities (of 100 cities) will work with their respective State Pollution Control Boards (SPCBs). In addition to the above mentioned measures, the Supreme Court ordered that only BS IV compliant vehicles to be sold from April 1, 2017. Such vehicles require a special fuel known as DEF( Diesel Exhaust Fluid) to be used in the engines. DEF helps to reduce the amount of emissions (nitrogen oxide ) being emitted into the air by 90%. DEF can be used in most diesel powered vehicles such as tractors, buses, trucks and cars. DEF is non-toxic and is made of urea ( 32.5%) and de-ionized water(67.5%). According to the BS IV norms, all diesel powered vehicles must have a separate DEF tank. The fluid must be then injected into the tank just like how you fill diesel in the tank. Also, it needs to be refilled whenever need be. Adblue is a reputed DEF and is available easily across India. If you are looking for a manufacturer/ supplier of Adblue, you can easily get it from Inabgo. It is a trusted company that deals with Adblue. You can contact the expert there and understand how Adblue can help reduce the harmful emissions from your vehicle and also about how frequently you need to refill it. Air pollution is a serious issue and everybody must join hands to curb it. With BS IV norms becoming compulsory in India and other measures taken up by authorities to tackle the situation, we can definitely bring about a change in the air quality.